Vaujany is a mountain village, located at 1250 meters high on a sunny plateau, facing the Grandes Rousses peaks. Located at the heart of Oisans, part of the Alpe d’Huez Grand Domaine ski area and on the outskirts of the Ecrins National Park, Vaujany enjoys a very privileged situation. 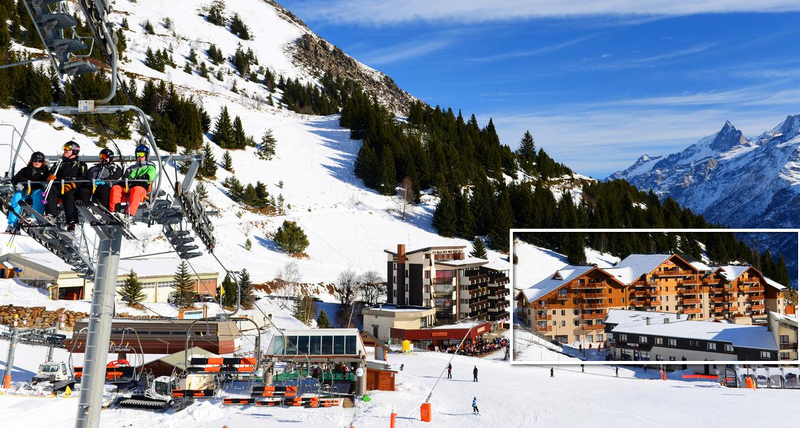 Vaujany ski area boasts 56 lifts, 120 pistes, 53kms of pistes, 2 snow parks and access to Grand domaine Alpe d’Huez ski area and its 250kms of pistes at high altitude. It boasts the longest piste in the world the Sarette with 16kms length. With magnificent facilities (aquatic center with 25m pool, slide and spa, indoor ice rink with 900 seats, a bowling alley, many shops, ultramodern escalators …), the ski resort of Vaujany offers great possibilities for family stays thanks to the many activities and events organized throughout the winter. The environment of the village also allows to discover a gentle mountain safely and enjoy the natural treasures of the site with professionals confirmed during snowshoeing, ski lessons or all the sporting and recreational activities offered on the Pole Sports and Leisure or by the animation service of the resort. Vaujany has everything to seduce you: the charm and authenticity of a real village, the most efficient equipment for skiing, skating, hiking or snowshoeing. Imagine the warm atmosphere of a village resort and the great playground that is the ski area Alpe d’Huez large ski area. Vaujany is part of the 8 municipalities forming the area of ​​Alpe d’Huez Grand Domaine SKI and totaling 250km of slopes from 1100 m to 3330 m altitude. Open from the beginning of December to the end of April, this immense gliding area has one of the largest snow-making plants supplying some 923 snowmakers and guaranteeing the snow cover of 75 km of track. – At the ski resort of Vaujany / Oz en Oisans: 75 km of gliding on 41 tracks, 22 lifts. An ideal area for young and old, with varied slopes and guaranteed snow. – in the Alpe d’Huez area and its 4 mythical descents of about 2000m vertical drop! 4 routes to go down in one go, without taking a lift! Accessible via the cable car, the Circuit des Lacs (20 km) and the Poutran Loop (10 km) allow Nordic skiing enthusiasts to practice their favorite sport in a beautiful setting.